Montes Seafood Emporium, wholesale seafood dealer and distributor located in the New Fulton Fish Market specializes in red snappers, and snappers from all around the world. 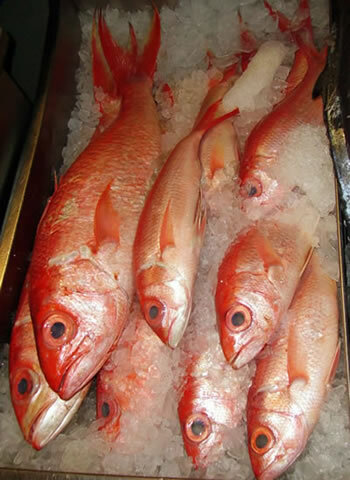 We are the one of the largest wholesale red snapper dealers in the New Fulton Fish Market and perhaps the United States. Along with snappers , we also specialize in grouper. We handle any kind of snapper and grouper that can be found anywhere. We receive red snapper seafood from California, the Southern United States, any kind of seafood species out of the gulf of Mexico, and anywhere in the USA. We are big importers of seafood from Brazil, Mexico, Trinidad, or where ever the seafood products are. We are also strong with kingfish, whiting, barracuda, crab meat as well as a wide variety of other seafood species. We offer a wide variety of specialty seafood daily to the specialty cuisines of the Caribbean nations; Jamaican seafood, Hispanic seafood, as well as many other ethnic cuisines. For ocean fresh seafood at its very best, come to Monte’s Seafood Emporium. We carry a wide variety of high quality, fresh seafood products. You can be rest assured knowing that you’ll receive your products directly from the boats via Monte’s. Your Visa, MasterCard and Debit Cards are always welcomed. So come to Monte’s, we look forward to serving you!